Paco Díaz (Palma de Mallorca, Spain) on 31 August 2009 in Architecture. Oh, my! This is like something out of a George R.R. Martin fantasy novel. Beautiful!! OH< MY :))))))))))) As Steve said , this picture is like from a novel :))) Fantastic work !!! Bel angle de prise de vue! Very nicely composed and your lighting is very well done here. Great work! Cette composition est très mystérieuse! Un léger traitement lui confère une atmosphère dramatique frissonnante! C’est très agréable et très beau!! WOW!!! Que castillo mas espectacular, me gusta muchisimo ese cielo que le da un soberbio dramatismo a la fotografia. Que bonitoooo!! me encanta este cielo que enmarca el Castillo. Amazing tones and sky colors! interesting composition!! Amazing capture!! Well done! Hello, here I am again! Yes, i was in Austria, a beautiful country!! very dramatic and excellent composed! Quel superbe château hanté, non ? Il me semble voir dans les nuages un fantôme qui s'en échappe !!! Splendide photo qui lui vaut 5 étoiles. Oh...I am awed into silence...oh all fantasies have come true! i would bet there to be ghosts walking those corridors!!! ;) lovely shot -- the mood is a bit chilling! Que castillo tan bonito, la composición de la foto es estupenda, el cielo la hace misteriosa!!! Saludos. it is an artistic take with you . a great architectue photo . excuse me if i can not speak englosh well ! Such a mood you've created here, Francisco - a brilliant use of the heavy sky. Un beau château, et son coté austère et dramatique est amplifié par le ciel nuageux à souhait. Effectivement on s'attend à voir sortir un fantôme, brrrr !! I choose this tem for my image and look to the anten where it is above the board name . do you understand dear ? Magnifique ce château! Tu as bien su donner à ta photo l'ambiance qu'il devait y avoir quand les chevaliers rentraient après avoir guerroyer! une ambiance particulièrement bien rendue avec ce beau ciel menaçant ! Superb sky ... exellend framed. Wow PAco! What a sky you got there!These towers on top look so marvelous against it! Great capture! beautiful ambiance. it really draws you in. La verdad es que la edición del cielo está estupenda. Magnífica toma, Paco. Me encanta ese tratamiento tan suave. El castillo, majestuoso y el cielo de coña. un endroit magique, le chateau de barbe-bleue ! 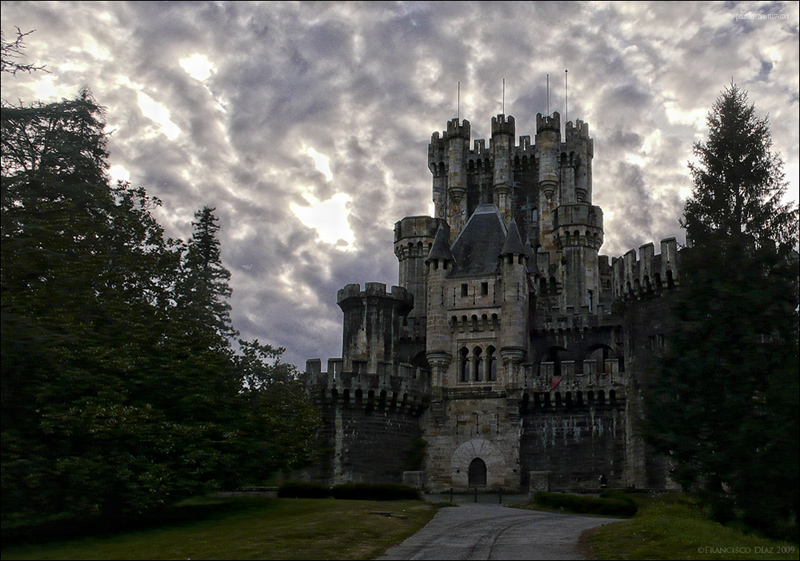 Just like in the storybooks....how ominous the clouds and glorious the castle :) Great capture! Absolutely wonderful! The colours and the detail are so striking. Well done. Wow Paco! I like the processing and the color tones on this! How old is this Castle? Great work on this image! Most impressive location! And processing as well! This would make a good place for Dracula. if only Bram Stoker would come back from the dead to see this!!!! !